I’m gonna level with you guys. I’m leery of doing product reviews on this here blog. Quite frankly, my brand loyalty to Trader Joe’s has reached unhealthy levels. It has gotten to the point where if I shop elsewhere I feel compelled to wear a wide-brimmed hat and dark glasses. And a polka dot dress. Makes me feel like I’m on The Sopranos. 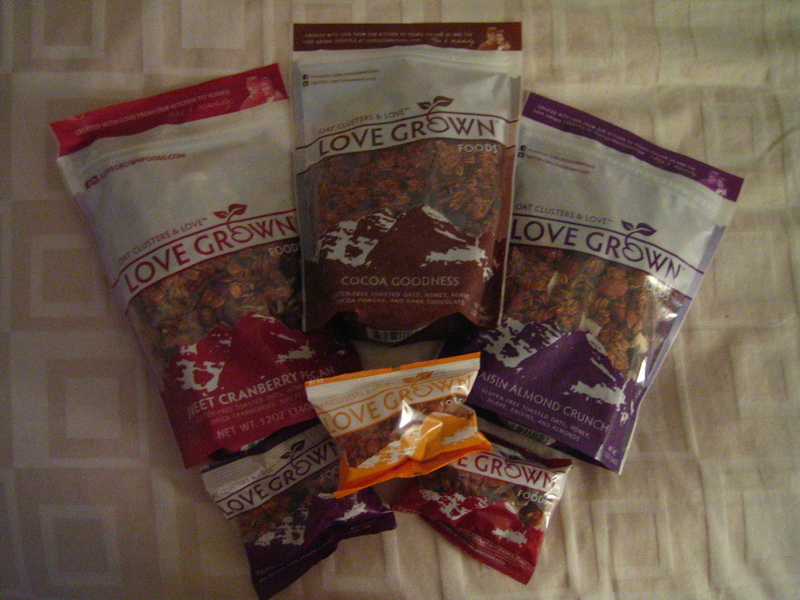 So when Laura from Love Grown Foods contacted me about sampling their all-natural, gluten-free granola, I was hesitant. And then I realized that when it comes to food, the only thing I love more than TJ’s is free stuff. I have to tell you- though I am not a gluten-free eater, this granola does not mess around. and tried the raisin almond crunch today. 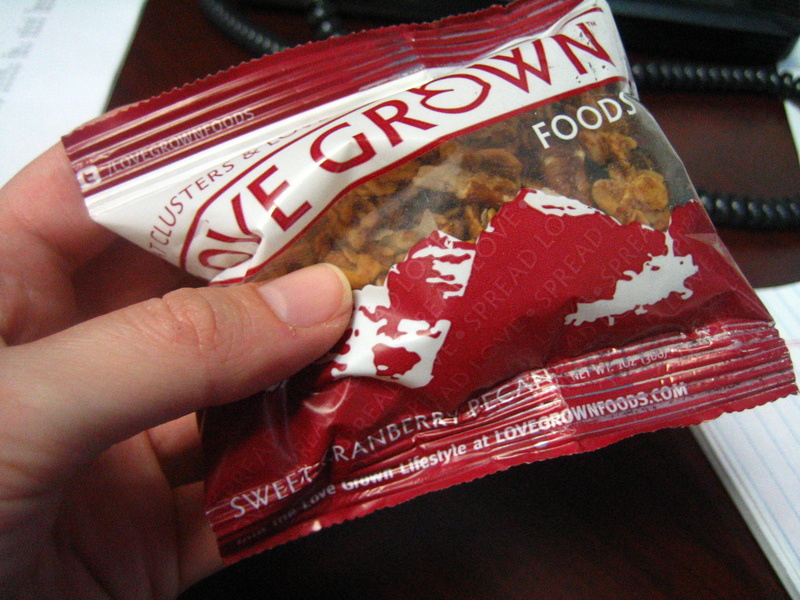 The dried fruit is one of the best things about this granola. You know when you bite into a raisin in granola and feel like you’re chewing a small, hard, gummy piece of eraser covered in a layer of caked on sugar that eventually makes your jaw lock up? Not so much with Love Grown’s fruit. They sort of plump up the fruit and sweeten it with agave, so the cranberries and raisins stay pretty soft. My jaw appreciates it. For the sake of research, I also broke open the big 12-oz bag of cocoa goodness as a pre-volleyball snack. I have to say, I like all of these flavors (they also make apple walnut delight and simply oats varieties), but the sweet cranberry pecan was my favorite. My only complaint is that the granola doesn’t have a whole lot of chunks in it (except for the cocoa goodness). I usually snack on my granola rather than eat it with a spoon or sprinkled on top of oatmeal, so I tend toward the “chunkier” granola brands. They’re easier not to spill all over my desk. 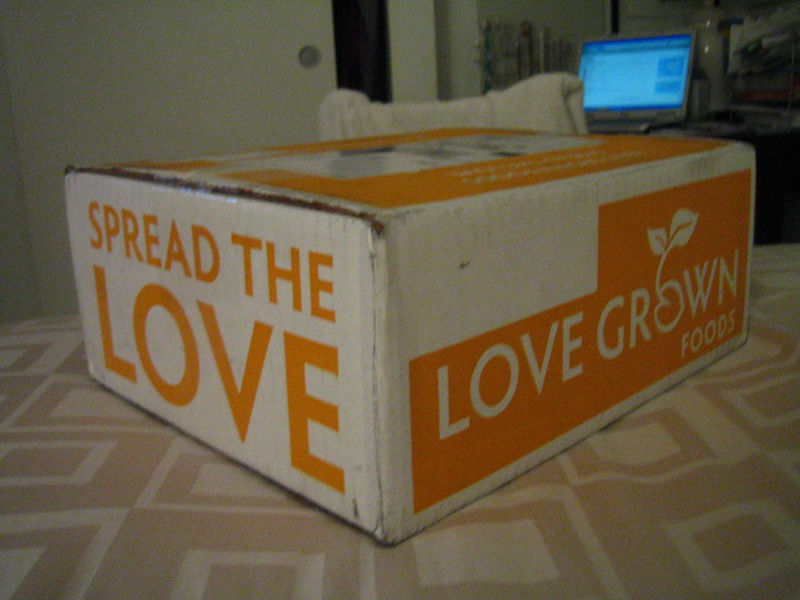 Love Grown is based out of Denver and you can buy their granola on their website or these stores (I think I’ve seen it on Amazon as well) for $4.99/12-oz bag. Seeing that I have a friend that’s moving to Denver next month (hi, Sara! why you gotta leave me? ), I feel that I may need to make pit stop at their factory when I visit to say hi and pick up a few more bags of the good stuff. Maybe I can start obsessively shopping there now, too. Jealous! That granola looks amazing. And I’ve yet to try it. Maybe one of our road trips should be to denver? Well I am fully intending on visiting. Don’t threaten me with a good time. Haha, Megs it is! I love Kashi Go Lean Crunch- back in the day that’s what I’d bring as a snack to classes. I got these and LOVE them..seriously quite possibly the best granola I’ve had. I’ve been saving the pecan cran to eat next week. I’m bummed I didn’t get any mini-bags though! Lucky! Ive seen this granola all over the blog world – it looks fantastic and I have yet to try it. I dont even know if you can get it here. I swear, we miss out on all the good stuff in Canada. Except Tim Hortons of course. But thats totally not the same thing at all. Donuts and granole are very different.